It would probably be exaggerated to say that economists, in general, have considered the issues of succession, bequest and inheritance to be of the utmost importance; it would, however, certainly be false to speak of a complete neglect. 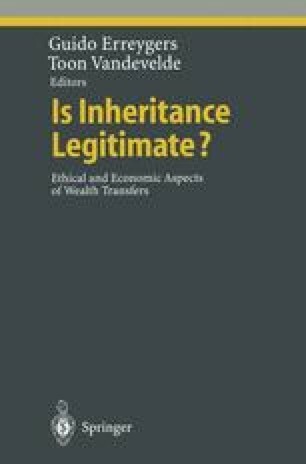 Many economists have dealt with the question of the transference of property rights when a person dies1; in this paper I review some interesting contributions which have been made over the years. I have not aimed at being in any sense complete; the paper is more a personal tour d’horizon than a systematic inquiry. I will not say anything about recent developments in the field; the paper ends somewhere in the 1940s. Moreover, it is biased towards approaches which try to combine liberalism and socialism, coming from authors who, as Cannan (1926, p. 236) once put it, argued that a reform of inheritance would lead to situations in which “the individualist lamb would lie down with the socialist lion”. It is indeed striking that many authors thought that a reform of the laws of inheritance would allow society to move towards more equality, especially equality of starting conditions in life, without disrupting the delicate framework of incentives which regulate the economic activities of individuals, in particular decisions to work and save. Typical for these approaches is that they take a middle course between two extreme positions towards inheritance. One is the ‘maximal’ individual liberty position: every person has the right to decide what should happen with his or her property after his or her death; in this view, the right of bequest is a ‘natural’ right. The opposite position is that of ‘minimal’ individual liberty: a person has no right at all to decide what should happen with his or her property after his or her death; in this view, property rights do not include such a thing as a natural right of bequest. These two positions are motivated by different attitudes towards liberty and equality; I contend that the most interesting writings about inheritance are from authors taking a ‘middle’ position, i.e. from authors who try to reconcile liberty and equality.